A committee hearing over the naming of a tree gets a little testy at the state capitol. 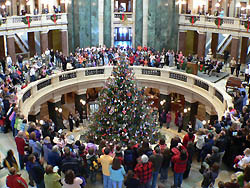 State Representative Marlin Schneider (D-Wisconsin Rapids) pushes legislation that would bring back the Christmas tree to the state capitol, rather than what he calls the cheapened and thoughtlessly re-named politically correct holiday tree. The Wisconsin Rapids Democrat says renaming the tree is just as absurd as calling the Jewish Menorah the holiday candle. However, Annie Laurie Gaylor of the Freedom From Religion Foundation testifies that we need to keep a separation of church and state, and besides, she says, the tree doesn’t even need a name. “…and I will concede to you that you won’t be happy until we have a Godless world,” he says.